Parents are often dismayed and outraged when a playmate at daycare or on the playground bites their child. If your child is the biter, feelings of despair, anger, and helplessness may lead to a series of ineffectual punishments and interventions. What can you do to discourage your little biter? 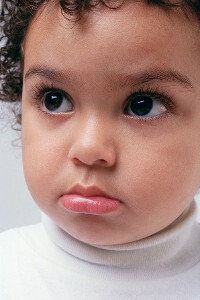 Toddlers often bite out of frustration or anger. If their basic needs such as hunger, thirst, toileting, naptime, and attention from an adult are unmet, the resulting frustration brings on a bite. Meeting these basic needs puts a stop to many occurrences of biting. Countless children bite playmates during altercations over a toy, a snack, a pacifier, or a position on an adult's lap. It is a defensive, self-protective action. Teaching the child to deal with his feelings in an acceptable manor ends this type of biting. Some children bite as a way to bully others. This is a behavior problem exhibited by strong willed children. Prompt intervention is required. Firmly explain to the child that this is not acceptable behavior and that you will not tolerate biting. We can't expect our children to speak to us respectfully if they hear us speaking disrespectfully to our spouse, coworker, or another family member. Our kids will model our behavior. Keep this important point in mind when communicating with others. It is important to address every biting occurrence. Waiting to intervene until a behavior pattern develops makes putting a stop to biting harder for you and the child. 1) Firmly tell the child that biting is not nice and that he is not to do it again. 2) Provide immediate consequences for the behavior. Remove the child from the play area. Initiate a time out or withdraw a favorite snack, privilege, or toy. Be sure that the child is aware that the punishment is a direct result of biting. Ask them why the punishment occurred so they have clearly understood it's because of biting. Provide reminders that further biting will result in undesirable consequences. 3) Instruct the child to apologize for biting. Explain that biting hurts both physically and emotionally. 4) If biting occurs with an older child, ask the child why they felt the need to bite. He or she may be able to tell you what feelings or actions led up to the incident. 5) Teach your child constructive ways to deal with frustration and feelings of anger. Have them kick a ball outside, talk about their feelings, switch activities, or seek out the soothing comfort of a favorite toy or blanket. 6) Provide praise and reward for every instance your child handles a period of frustration or anger without biting. Use a behavior chart to help reinforce nonbiting behavior. 7) Be consistent with punishment for biting. Instruct other caregivers what to do when biting occurs and create a unified front. Never allow biting to slip by unpunished. 8) Biting your child is not recommended. This models unwanted behavior and confuses the child. If it is OK for you to bite him, why is it unacceptable for him to bite another child? You can stop biting behavior with consistent, early intervention. Set clear behavior expectations and understandable, age-appropriate consequences for biting. Balance punishment with positive praise when your child chooses to react appropriately instead of biting. Find helpful and creative ideas for parents and grandparents while you shop our great selection of dependable kids furniture and classic toys. Visit https://www.TheMagicalRockingHorse.com today!